Fan Fun: How Many Licks? Since Mr. Owl first dared to unravel one of the confectionary world's most puzzling secrets in the classic 1970 TV commercial, dedicated Tootsie Pop fans everywhere have tried to provide a definitive answer. Many have attempted, and failed, to lick their way to the center of the Tootsie Pop. The temptation to bite and reach the embedded Tootsie Roll prize has proven too great... just like it was for Mr. Owl. For the truly disciplined who have made it successfully to the center, Tootsie places them in its highest regard. And the pages linked below are dedicated to their valiant struggle. Have You Made It to the Center? If so, download your certificate of achievement in the Clean Stick Award! Scientific studies address Tootsie Pop's great mystery. 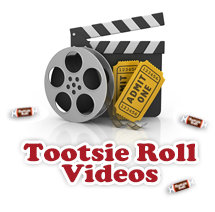 View how Tootsie Pops and other Tootsie products are manufactured.